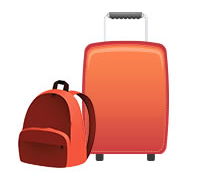 Send luggage to and from PennState University with My Baggage! My Baggage is the No.1 student shipping company for Pennsylvania State University, helping thousands of students transport their belongings to and from college every single semester. We provide a fast, reliable and low-cost shipping service for students! Founded in 1855, Pennsylvania State University is a public, land-grant, research-intensive university with campuses and facilities throughout Pennsylvania. It is in the top 1% of universities worldwide, and one of the most popular colleges in the US for international students. It boasts one of the largest alumni networks in the nation; from the co-creator of the Slinky, to the CEO of Nike and Robert Bruce Banner (otherwise known as The Hulk). At My Baggage, we understand that your big move to college is an exciting one – but it can also be super stressful one. Packing and moving your whole life to college isn’t easy. That’s why we make it our aim to make your move to college as easy as possible. My Baggage can transport all of your personal belongings to college without any stress. All you have to do is book and pay for your shipment online – it only takes a few short moments to do so! You can arrange the pick-up for a day that suits you. Once you’ve booked, we’ll collect your luggage and deliver it straight to where it needs to go. You’ll be given access to full online tracking information so that you can monitor your shipment every single step of the way. You’ll also receive handy SMS and email notifications to keep you in the know. If you happen to have any questions or concerns along the way, our dedicated customer service is always ready and willing to help. Low cost luggage shipping for students. Full online tracking, SMS and email notifications. Our objective at My Baggage is simple – to ensure that your experience of moving to college is as smooth and as stress-free as possible. That’s why we offer a convenient door-to-door pick-up and delivery service. We can collect straight from your front door! If you are living on PennState campus, we will collect from and deliver your items to the main reception area or designated postal room – our drivers aren’t able to access individual dorms for security reasons, so this is the best solution. Be sure to check the whereabouts of these locations with your college directly before you book. If you are an international student travelling to study at Pennsylvania State University, My Baggage can help you transport your belongings there without any added stress! My Baggage is a much more affordable option than paying for an extra bag on your flight. We ship to over 200 countries worldwide and offer a generous weight limit of 30kg – so you don’t have to be without anything important. We can help you get your luggage to your new home at PennState University quickly, safely and all at a price you can afford.